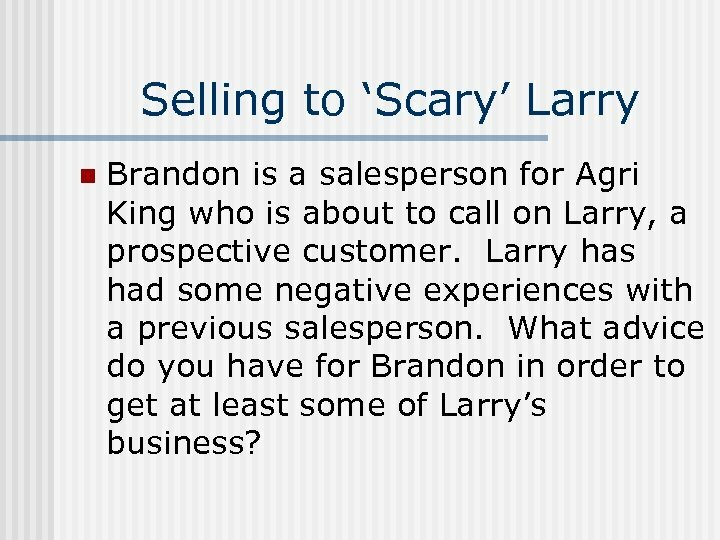 Selling to ‘Scary’ Larry n Brandon is a salesperson for Agri King who is about to call on Larry, a prospective customer. 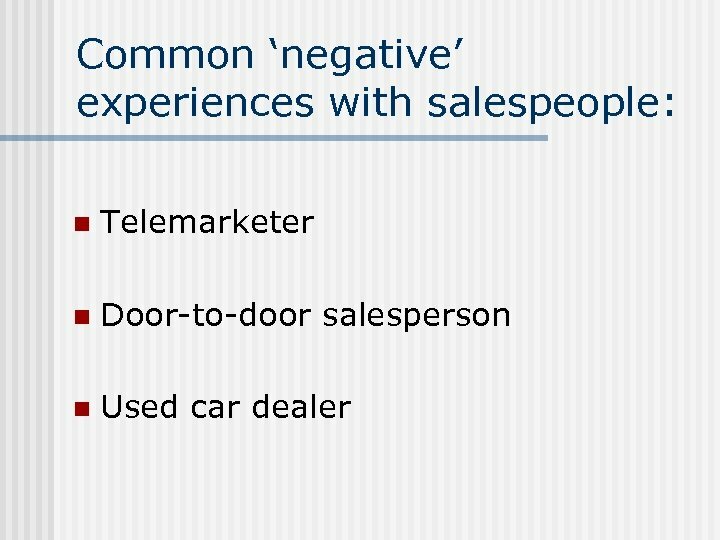 Larry has had some negative experiences with a previous salesperson. 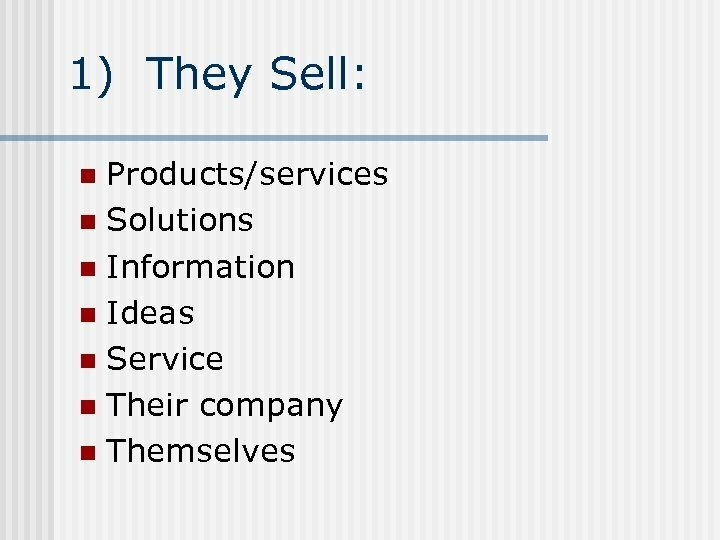 What advice do you have for Brandon in order to get at least some of Larry’s business? 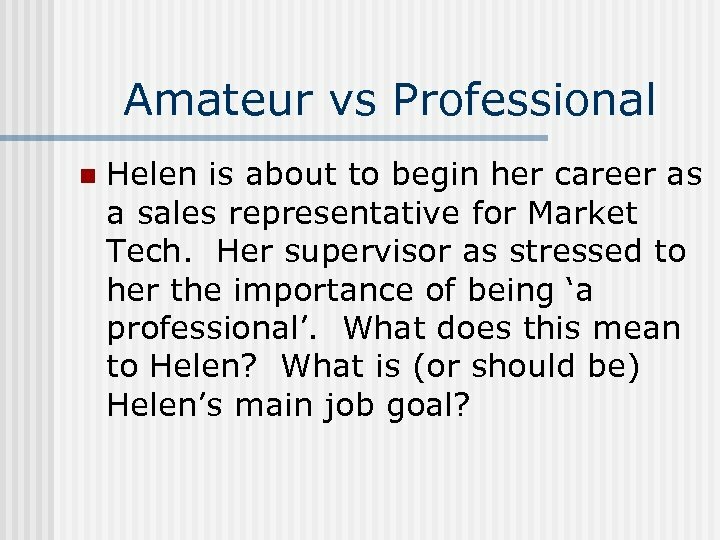 Amateur vs Professional n Helen is about to begin her career as a sales representative for Market Tech. 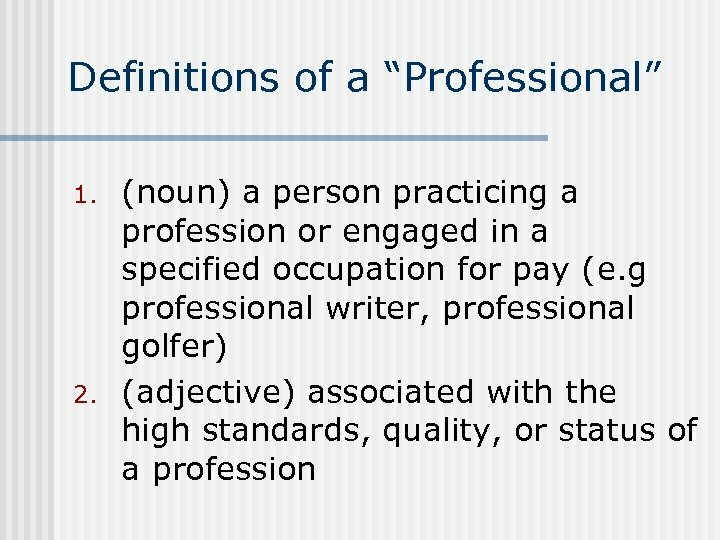 Her supervisor as stressed to her the importance of being ‘a professional’. 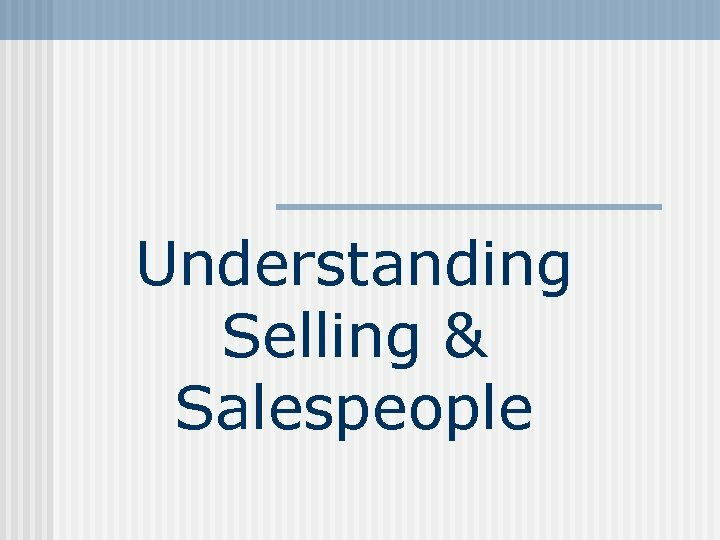 What does this mean to Helen? 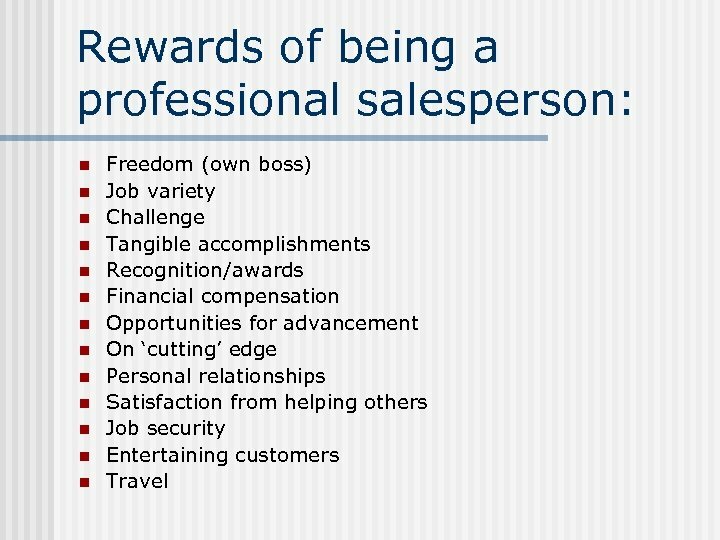 What is (or should be) Helen’s main job goal? 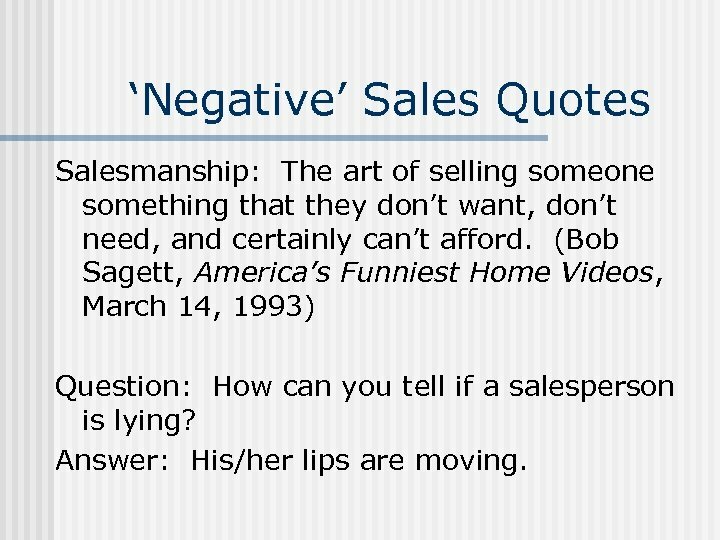 ‘Negative’ Sales Quotes Salesmanship: The art of selling someone something that they don’t want, don’t need, and certainly can’t afford. 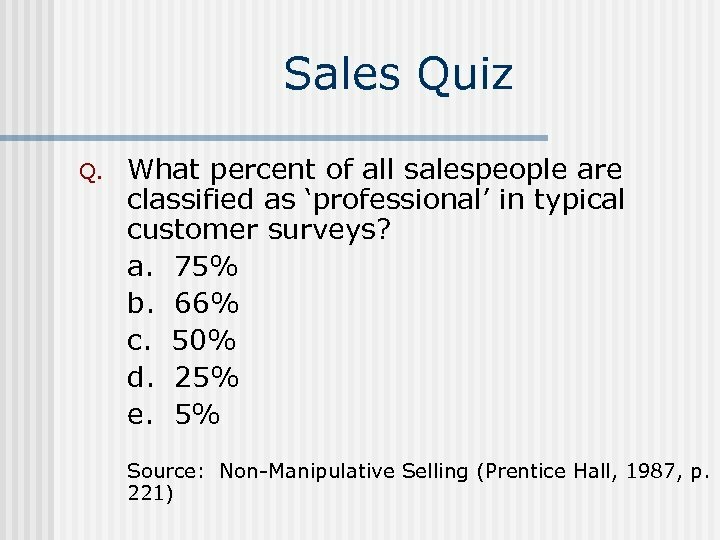 (Bob Sagett, America’s Funniest Home Videos, March 14, 1993) Question: How can you tell if a salesperson is lying? 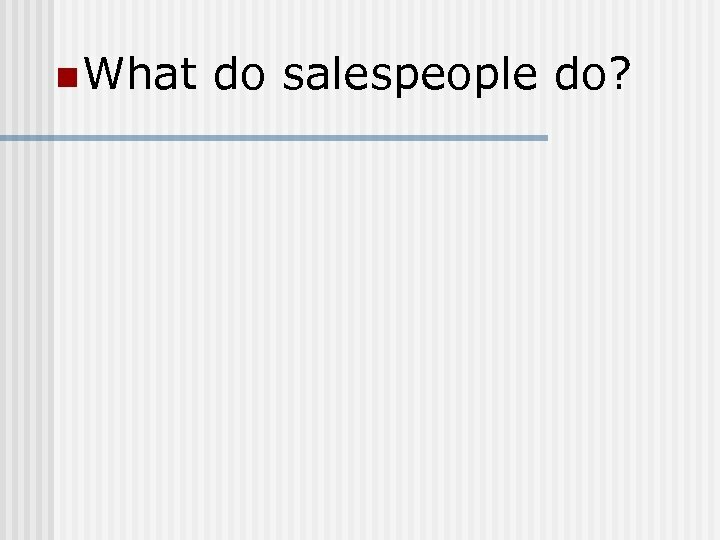 Answer: His/her lips are moving. 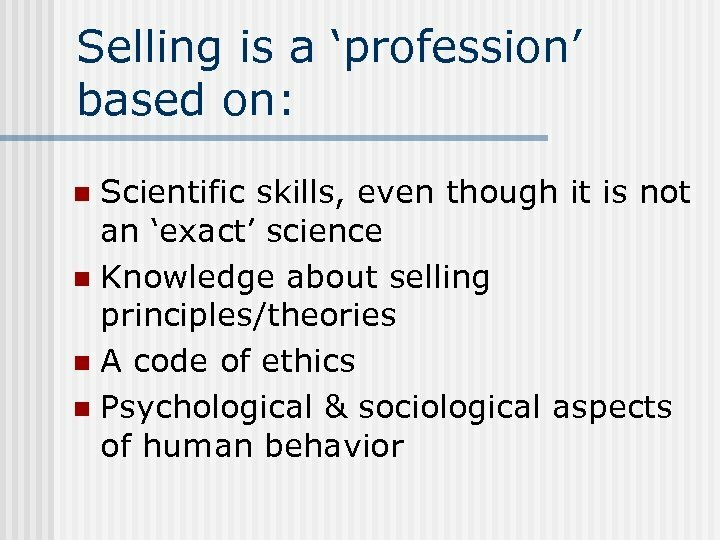 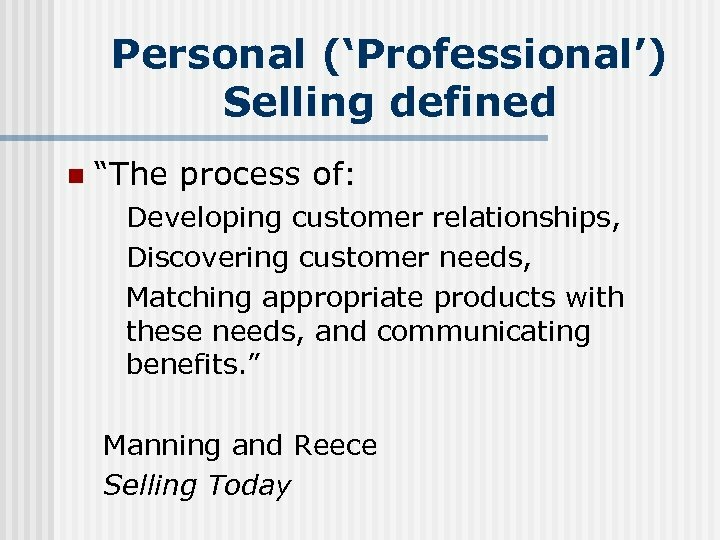 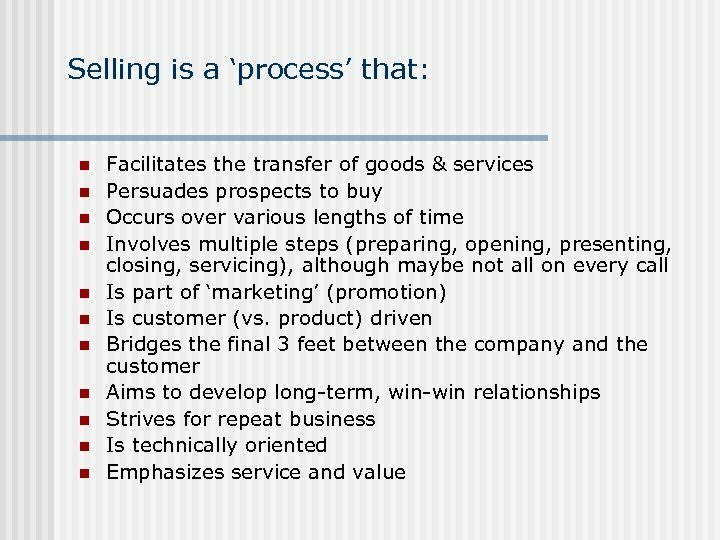 Preparing to become a successful, professional salesperson starts with an understanding of: n What selling is. 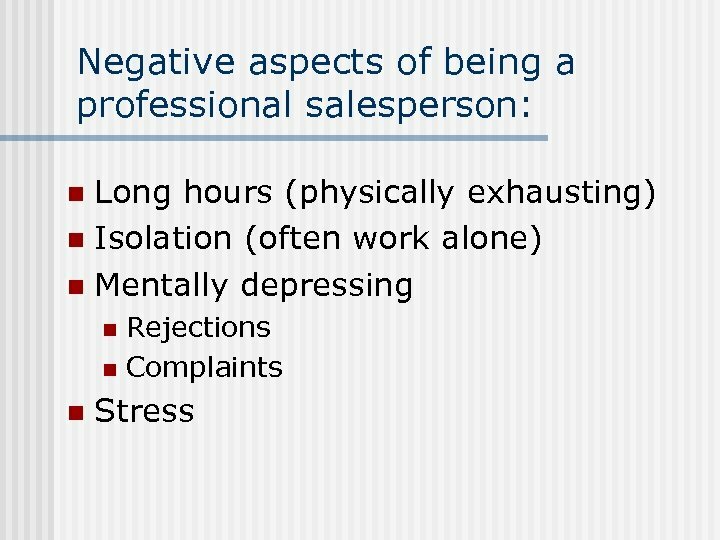 n What a salesperson does. 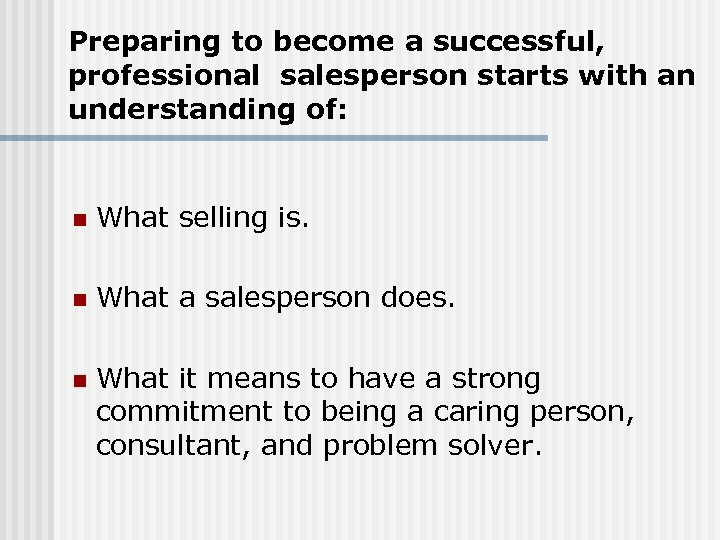 n What it means to have a strong commitment to being a caring person, consultant, and problem solver. 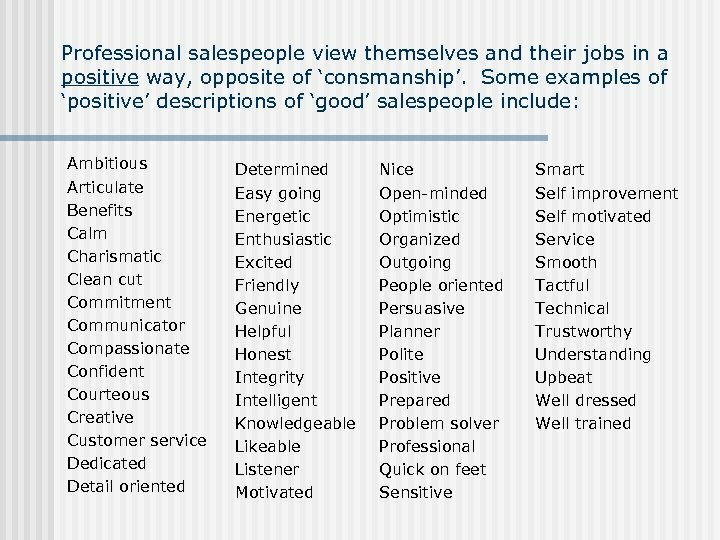 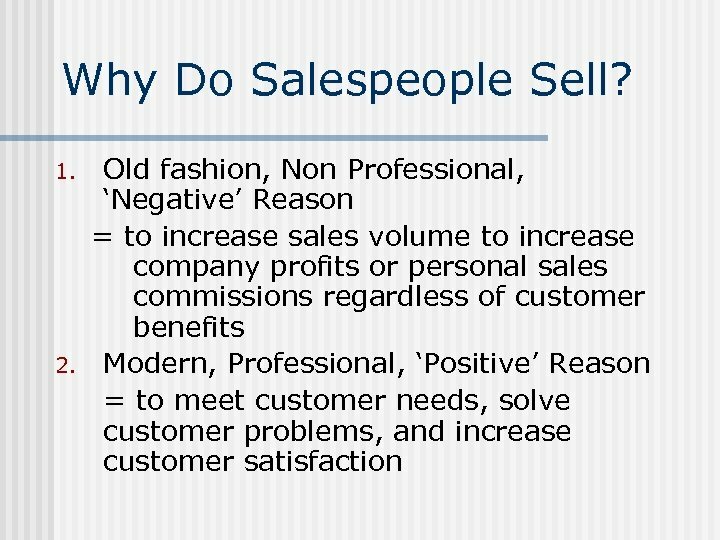 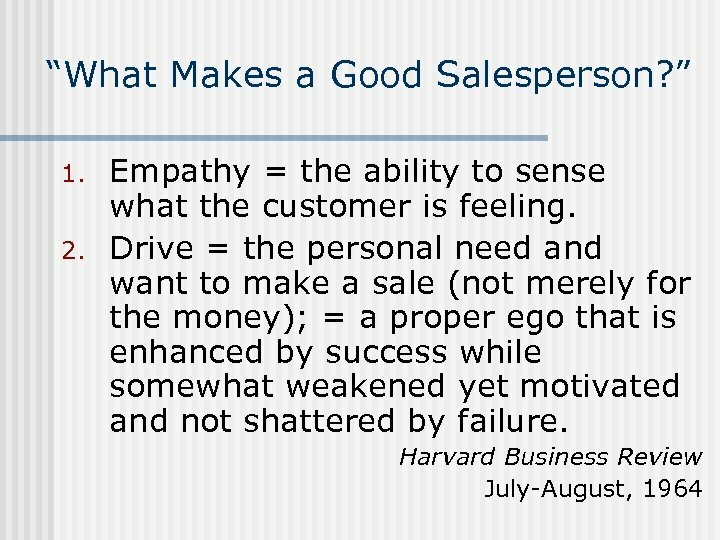 n What do salespeople do? 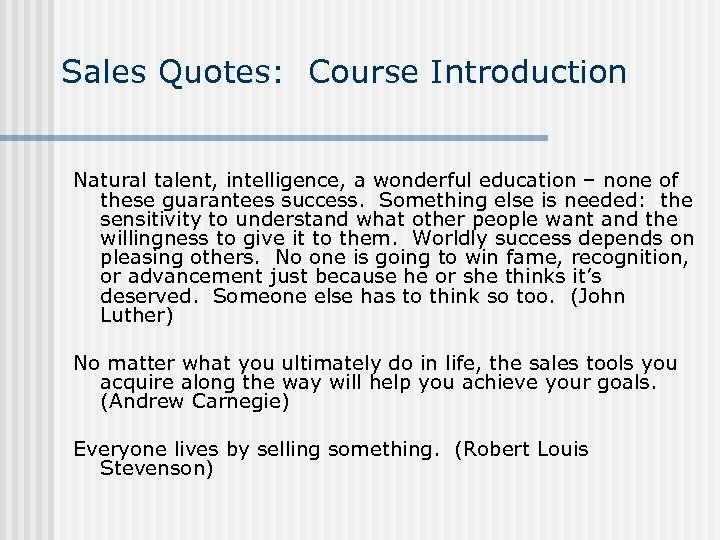 Sales Quotes: Course Introduction The foundation of good selling is the desire to help people. 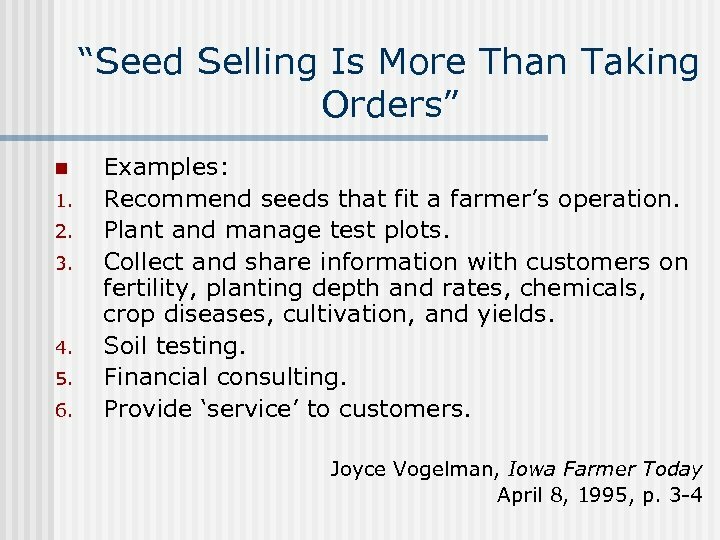 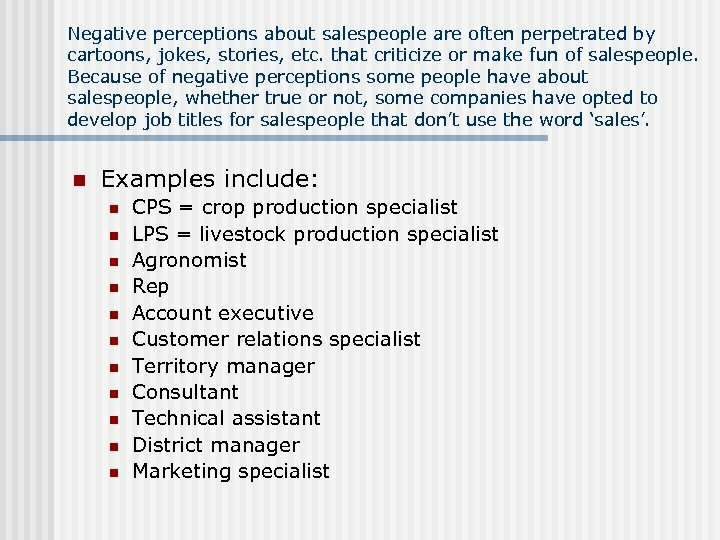 Professional agricultural salespeople typically view themselves as problem solvers and selling as problem solving. 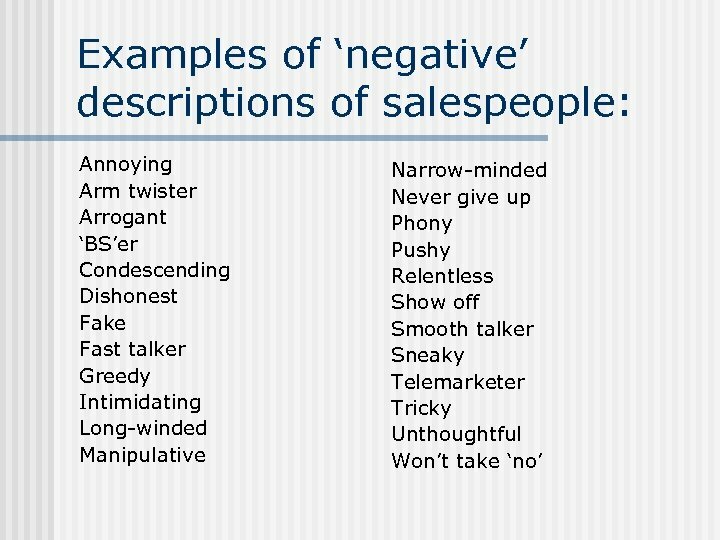 People tend to respond better to being treated as human beings than as dollar signs. 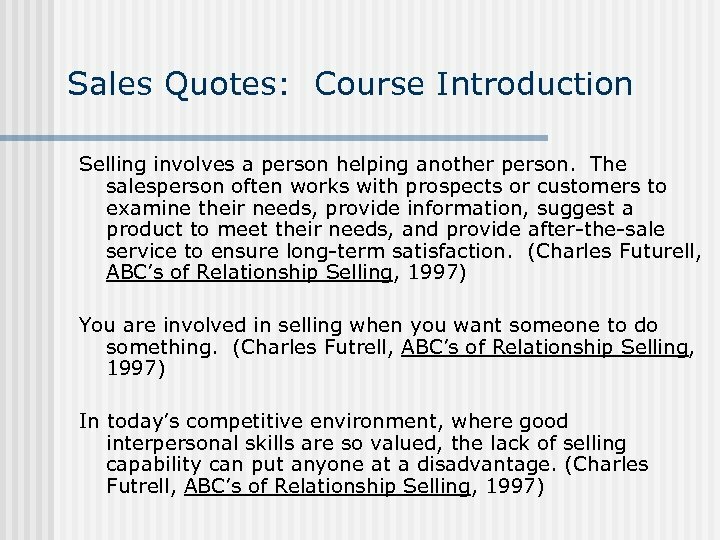 (Sales Upbeat, Feb. , 2, 1995) The high-pressure salesperson is as outmoded today as the horse and buggy. 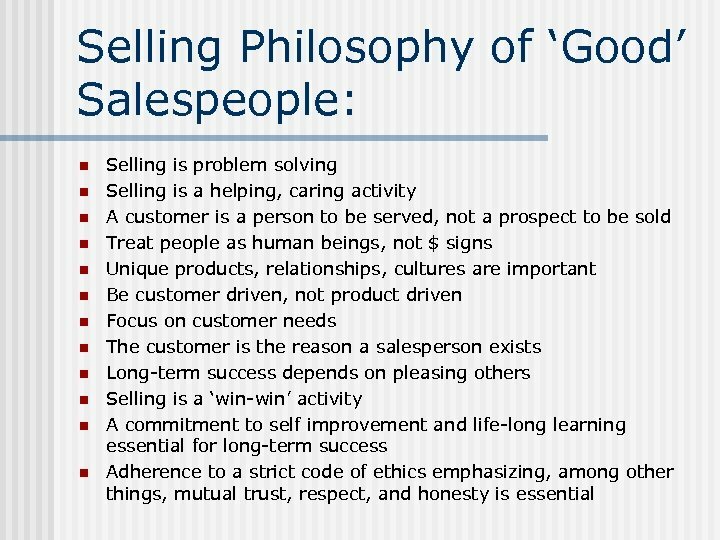 To be a top seller, today’s sales representative must have genuine character, sincerity of purpose, honesty, straightforwardness, and a desire to be of service. 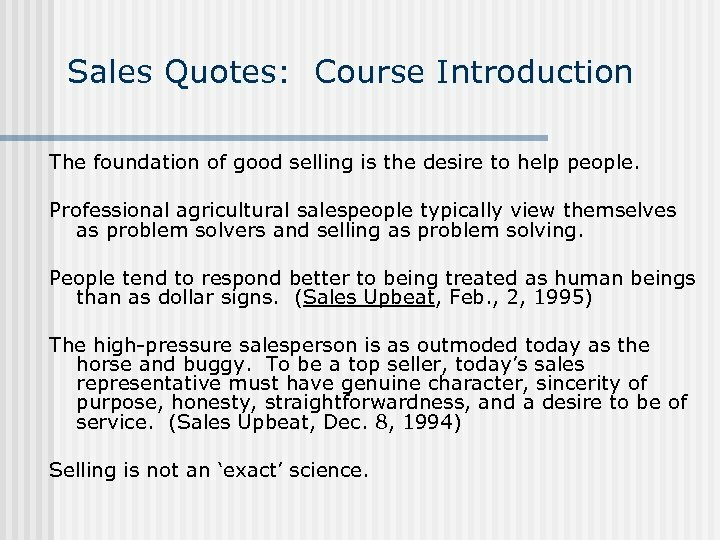 (Sales Upbeat, Dec. 8, 1994) Selling is not an ‘exact’ science. 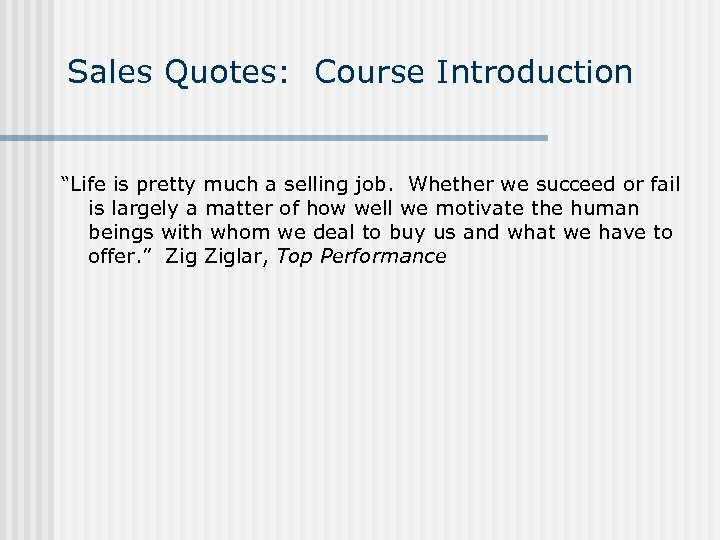 Sales Quotes: Course Introduction Selling is more than taking orders. 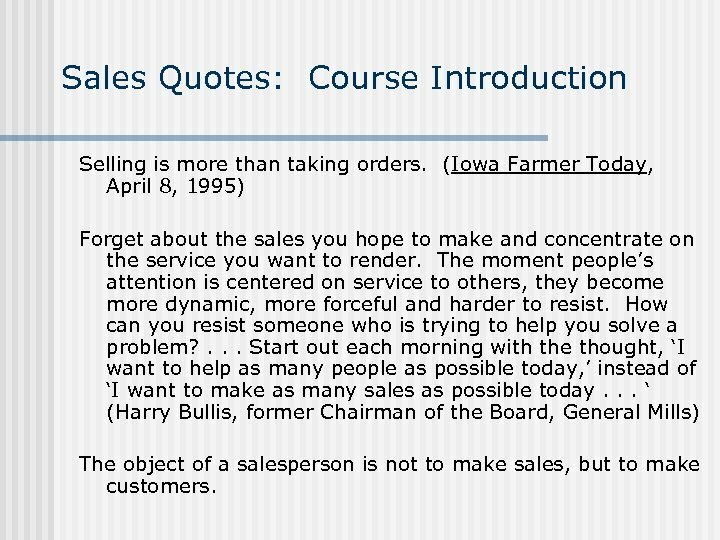 (Iowa Farmer Today, April 8, 1995) Forget about the sales you hope to make and concentrate on the service you want to render. 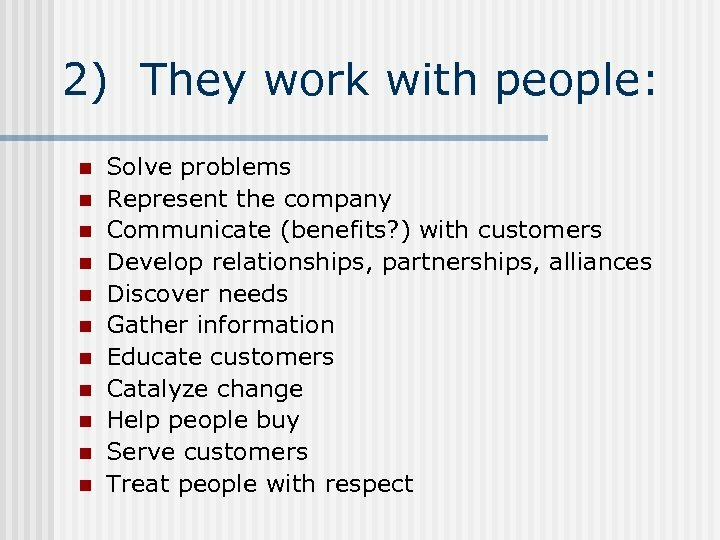 The moment people’s attention is centered on service to others, they become more dynamic, more forceful and harder to resist. 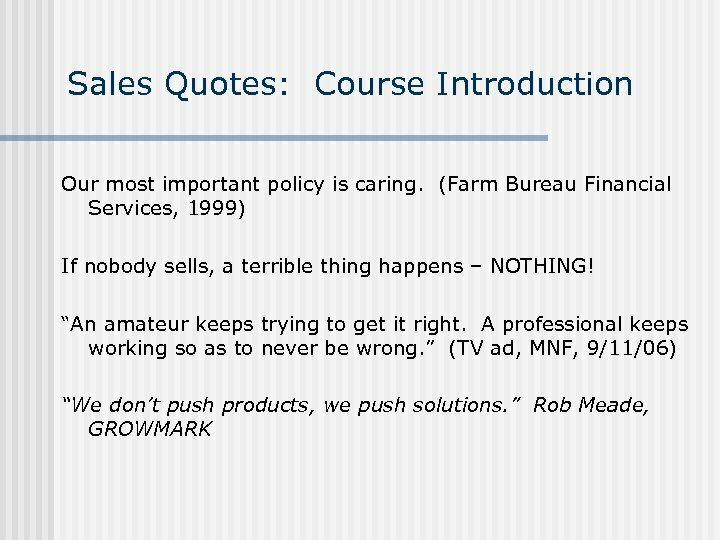 How can you resist someone who is trying to help you solve a problem? . 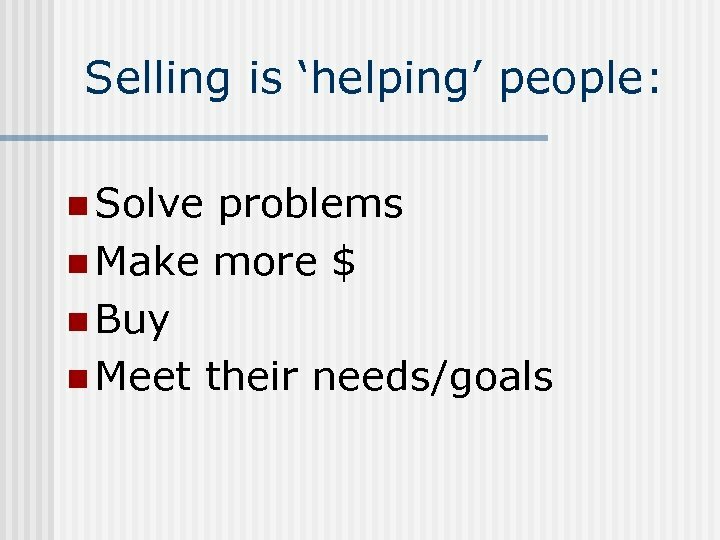 . . Start out each morning with the thought, ‘I want to help as many people as possible today, ’ instead of ‘I want to make as many sales as possible today. 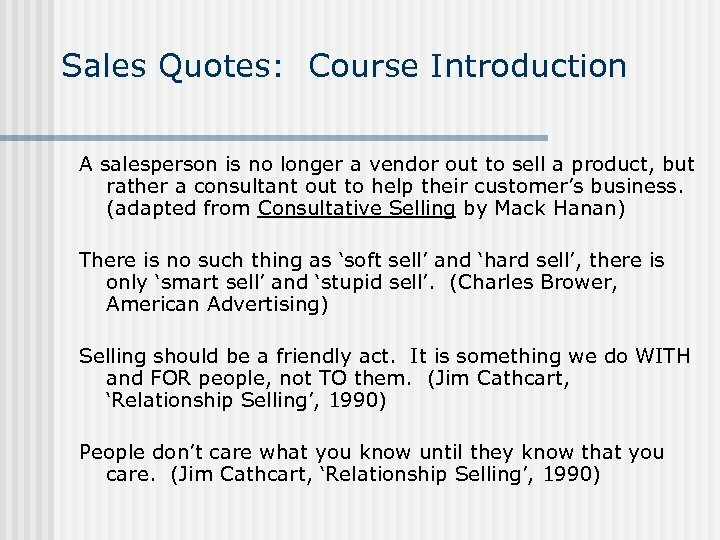 . . ‘ (Harry Bullis, former Chairman of the Board, General Mills) The object of a salesperson is not to make sales, but to make customers.